Furnishing your home with electric radiators is an effective way to heat your rooms but choosing an electric heating system doesn’t have to mean settling for a simplistic and unattractive storage heater! 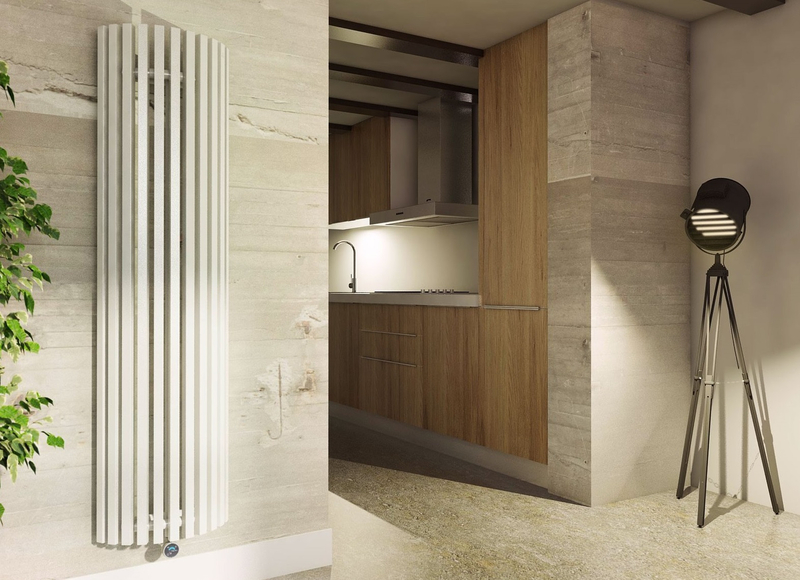 With a wide range of designer electric radiators to pick from, electric heating doesn’t mean compromising on style. As well as allowing you to transform the way you approach heating, we also think that opting for an electric radiator can be an opportunity to view your radiators as an exciting interior choice. One way to make a bold statement through your heating system is with a vertical electric radiator – space-saving, slimline and attractive, vertical radiators are an ideal way to make the most of a smaller property, utilise wall space and create an interior feature. 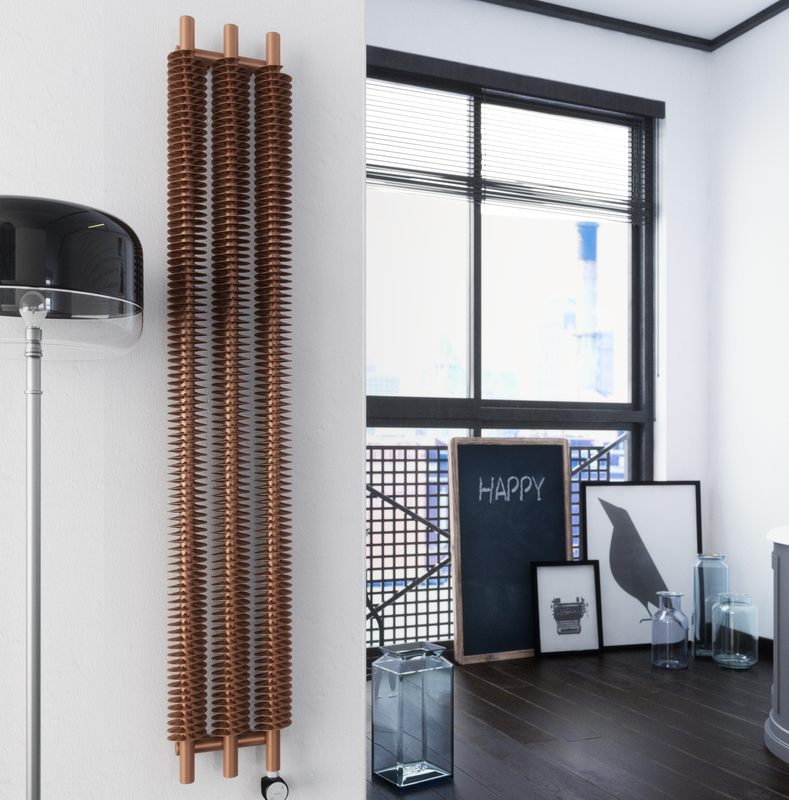 With a wide range of slimline electric radiators to choose from, we’ve picked our favourites to help you find the perfect vertical radiator to suit your personal style. 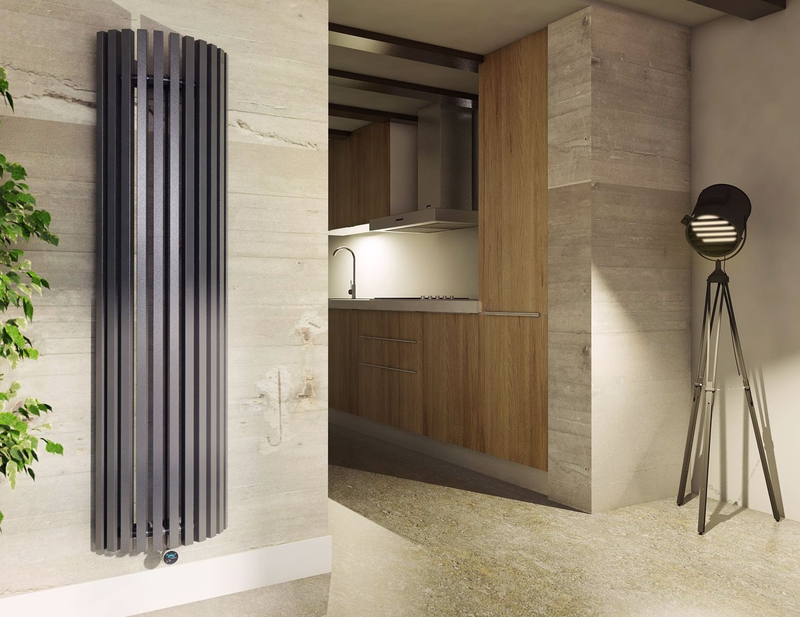 As a truly eye-catching electric radiator that combines contemporary design with modern functionality, the Terma Ribbon is an ideal way to turn your heating system into a striking artistic feature. The vertical design of this electric radiator means that it’s a great choice for rooms with limited wall space however the unique swirling features help to ensure that the Ribbon is more than just a radiator. Available in copper, grey and black finishes, it’s easy to select the industrial style Ribbon that’s right for your space. Using the Terma MOA Blue heating element, the Ribbon can be controlled from the Terma Blue Line Heating App which gives you the control to adjust your heating from your phone and even create a personalised 7-day heating schedule. But, if the app isn’t for you, the simple 5-stage output buttons on the front of the element ensure it’s extremely easy to use. As an attractive, slimline electric radiator, the Ribbon is an ideal way to take control of your heating system and add some unique personality to your home. Attractive vertical radiators don’t have to be expensive and the Ecostrad Ecowarme is the perfect example of a stylish and affordable vertical heating solution. Featuring a slim vertical frame available in crisp white and textured anthracite finishes, the Ecowarme makes a sleek and modern addition to any room. Using a combination of convection and radiation to ensure that both you and your room are heated, the Ecowarme can be considered a truly efficient heating solution. To enhance the efficiency of this electric radiator, the Ecowarme also utilises specially formed ceramic bricks which store heat meaning that your rooms continue to stay warm, even when the radiator is no longer using electricity. The integrated control panel and 24/7 digital programming of the Ecowarme are designed to give you increased control over your heating as well as the ability to create a bespoke heating schedule. The control panel of the Ecowarme can also be locked making this radiator an ideal choice for anyone who wants to rest assured that their heating schedule will remain unchanged. Boasting easy plug-in-and-go installation, your room can showcase the sophisticated fluted style of a vertical Ecowarme in no time. When it comes to choosing a vertical radiator, you don’t need to pick between the classic and the contemporary. The Terma Triga combines flat panels with a unique curved frame to create a perfect fusion of tradition and modernity. Available in two colours, you can choose your curved Triga in a crisp white for a clean minimal interior or a bold anthracite to make a dramatic statement with your heating. The understated style of the Triga makes it an ideal way to subtly add interest to awkward and unused spaces in your home. The Triga is Bluetooth compatible and can be controlled remotely from iOS and Android devices making it a truly modern heating choice. In addition to the app, the Triga can be controlled from the push-button interface on the radiator which allows you to easily tailor your heating by selecting between five heat outputs. The Triga is suitable for use in bathrooms so this vertical designer radiator is a stylish interior feature that can enhance your whole home. Vertical electric radiators are an excellent way to transform your heating system, offering space-saving benefits, energy efficiency and a unique modern style. The addition of a slimline electric radiator to your home means that your interiors will boast a sleek, contemporary aesthetic. 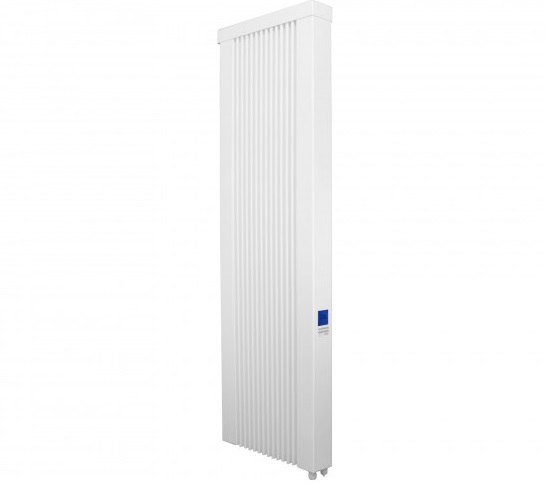 With a wide range to choose from, we’ve got a vertical electric radiator to suit the size and style of every space.